REGIONAL NEWS - AUSTRALIA/OCEANIA 20 E&MJ • APRIL 2018 www.e-mj.com Dacian Pours First Gold at Mount Morgans Dacian Gold reported its first bar of gold was poured at its Mount Morgans gold project in Western Australia on March 29. This key milestone, according to the com- pany, was achieved following a rapid and successful 11-month construction period in which the project construction was completed on time and on budget. Dacian Gold Executive Chairman and CEO Rohan Williams said the first gold pour was the culmination of a highly successful exploration and development strategy implemented at Mount Morgans over the past five years. "We started work at Mount Morgans a little over five years ago with several ex- ploration concepts that we tested once we completed our IPO," Williams said. 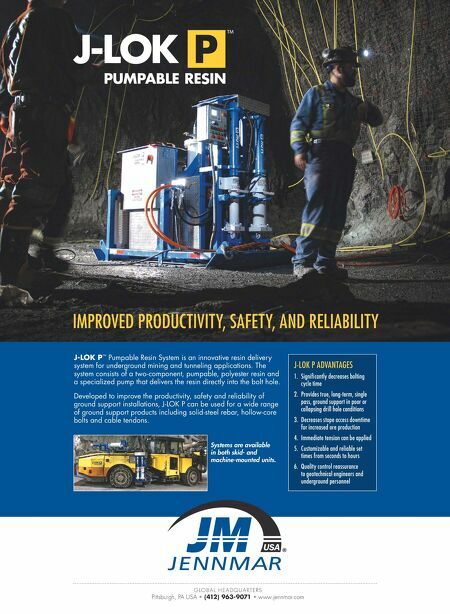 "What has been achieved in that time from discovery, including the drill-out, feasibility studies, financing, permitting and now completion of a major A$200 million project build on time and on bud- get is an amazing effort by a very talent- ed and hard-working group of employees, consultants and contractors." The company is now focused on ramp- ing up the mine to steady-state produc- tion of more than 200,000 ounces per year (oz/y). With the construction of the 2.5 million- metric-ton-per-year (mt/y) carbon-in-leach (CIL) treatment plant complete, Dacian ex- pects the new Mount Morgans CIL plant to be operating at nameplate capacity and to achieve the associated performance testing requirements with its EPC contractor, GR Engineering Services Ltd. (GRES), within the second quarter of 2018, William said. Mount Morgans is currently devel- oping its two mining centers, Westralia (Beresford and Allanson), forming its 1-million-mt/y underground operation; and Jupiter forming its 1.5-milion-mt/y open-cut operation. Underground mining at Beresford and Allanson continues to advance ahead of plan with the majority of activity occurring at Beresford, which has reported 2,200 m of ore develop- ment, ore intersected on six levels and six stopes currently in production. 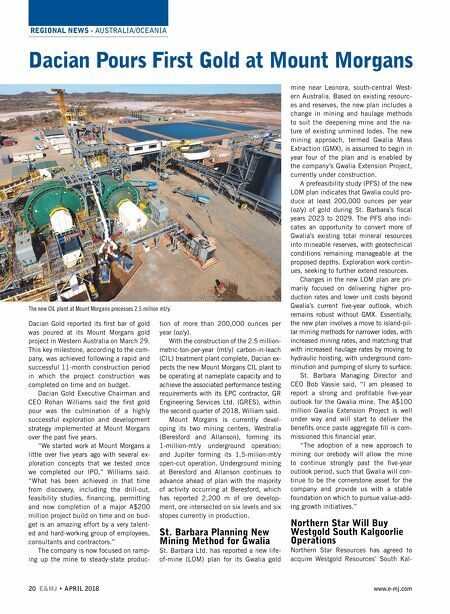 St. Barbara Planning New Mining Method for Gwalia St. Barbara Ltd. has reported a new life- of-mine (LOM) plan for its Gwalia gold mine near Leonora, south-central West- ern Australia. Based on existing resourc- es and reserves, the new plan includes a change in mining and haulage methods to suit the deepening mine and the na- ture of existing unmined lodes. The new mining approach, termed Gwalia Mass Extraction (GMX), is assumed to begin in year four of the plan and is enabled by the company's Gwalia Extension Project, currently under construction. A prefeasibility study (PFS) of the new LOM plan indicates that Gwalia could pro- duce at least 200,000 ounces per year (oz/y) of gold during St. Barbara's fiscal years 2023 to 2029. The PFS also indi- cates an opportunity to convert more of Gwalia's existing total mineral resources into mineable reserves, with geotechnical conditions remaining manageable at the proposed depths. Exploration work contin- ues, seeking to further extend resources. Changes in the new LOM plan are pri- marily focused on delivering higher pro- duction rates and lower unit costs beyond Gwalia's current five-year outlook, which remains robust without GMX. Essentially, the new plan involves a move to island-pil- lar mining methods for narrower lodes, with increased mining rates, and matching that with increased haulage rates by moving to hydraulic hoisting, with underground com- minution and pumping of slurry to surface. St. Barbara Managing Director and CEO Bob Vassie said, "I am pleased to report a strong and profitable five-year outlook for the Gwalia mine. The A$100 million Gwalia Extension Project is well under way and will start to deliver the benefits once paste aggregate fill is com- missioned this financial year. "The adoption of a new approach to mining our orebody will allow the mine to continue strongly past the five-year outlook period, such that Gwalia will con- tinue to be the cornerstone asset for the company and provide us with a stable foundation on which to pursue value-add- ing growth initiatives." Northern Star Will Buy Westgold South Kalgoorlie Operations Northern Star Resources has agreed to acquire Westgold Resources' South Kal- The new CIL plant at Mount Morgans processes 2.5 million mt/y.